Loaded with rice, beans, vegetables, avocado, cheese and spicy chicken, this Chicken Burrito Bowl is healthy, filling and utterly delicious. Another Mexican recipe! Wooo Hooo! I know I am not the only one excited about that, as whenever I have asked what kind of recipes you would like more of, the majority of you say Mexican. That is fine with me, as I make no secret that it is my favourite type of food. What’s not to love? I am back from my adventures in the French Alps and Geneva (posts on that coming soon) and although you would expect me to maybe post some French or Swiss recipe, Mexican food is what I missed. It was only 4 days, but that is a long time for me to go without anything spicy. 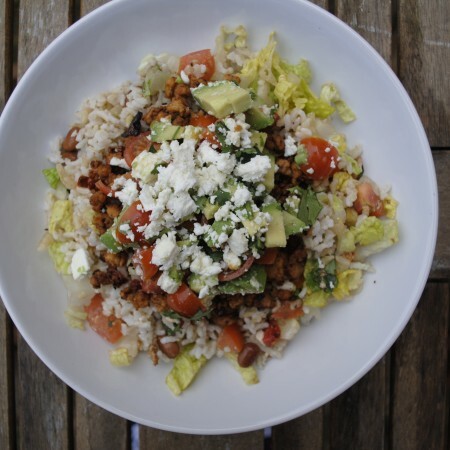 I realised that I have put up a recipe for a vegan burrito bowl, but not one for all the meat eaters. 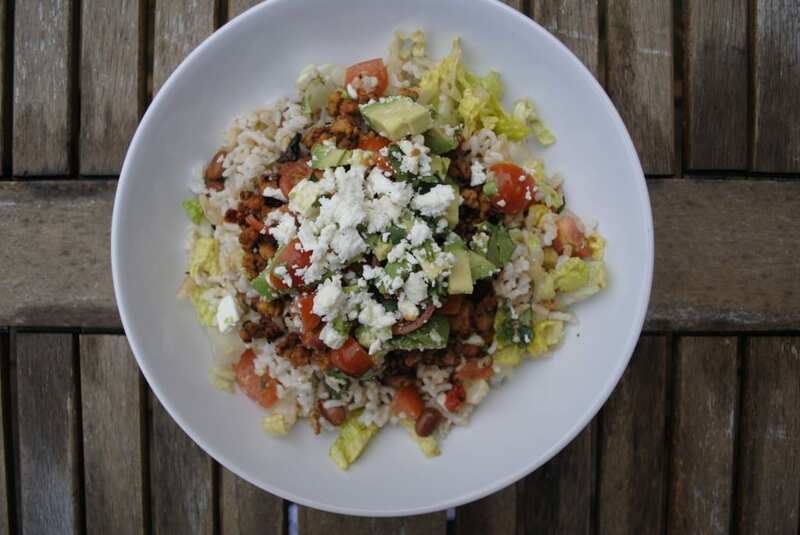 Of course you could just add meat to the vegan recipe, but I thought I would share my recipe for a chicken burrito bowl as it is a favourite in our house and so easy to throw together. You can also make lots of the chicken ahead of time and freeze it in portions and then get a portion out as and when you need it to make a quick burrito bowl. Mr HHH take the leftovers of this to work sometimes and he says it is good hot or cold. With any of my Mexican recipes, you can make them as spicy and as mild as you like. I did not find this very spicy at all and I added lots of homemade chipotle sauce to mine, but then I do LOVE spicy food, so you might find this is just right for you. If you ever make a Mexican dish that is too spicy, add a spoonful of Greek yoghurt on top to cook it down. It works the same way as sour cream would, but it is healthier. I made this for dinner last night and it is SO good. Even my boyfriend liked it and he is really picky. Yay! I am glad that you both enjoyed it. Yum yum yum ! mexican cuisine is my fav too… looks fabulous ! Thanks! I could eat Mexican every day! Fabulous recipe, I am always happy to see another Mexican dish. Can;t wait to read about your adventures in Geneva. Lots of Geneva photos coming up soon! Definitely on price anyway. Chipotle is crazy expensive over here. Feta goes so well on Mexican food! haha, yes, it definitely counts. Salsa is really good on salad too. I love any and all Mexican food! This looks delicious! I recently started making enchilads and they are so good! I love homemade enchiladas – can’t beat them! Just saw this on Twitter and clicked on the link straight away! Looks soooo good! Thanks 🙂 I hope you enjoy it! Welcome back! I have missed your blog posts and new recipes. This is a great one to start back with. All that feta – yum! Thank you 🙂 I shall be getting back to more regular updating now I am back. Looks wonderful Dannii. Any healthy Mexican recipes would be appreciated, it is my favourite type of food. I hope you had a great time away on your trip and you had some time to relax as well. I had a little time to relax, but I want on the go a lot of the time. I love Mexican recipes they are always so delicious and tasty and colourful. I would love to make a veggie version of this one. That is dinner tomorrow planned. LOVE Mexican food. Thanks Dannii! This burrito bowl looks delicious! I love Mexican food, so I know I will love this dish. 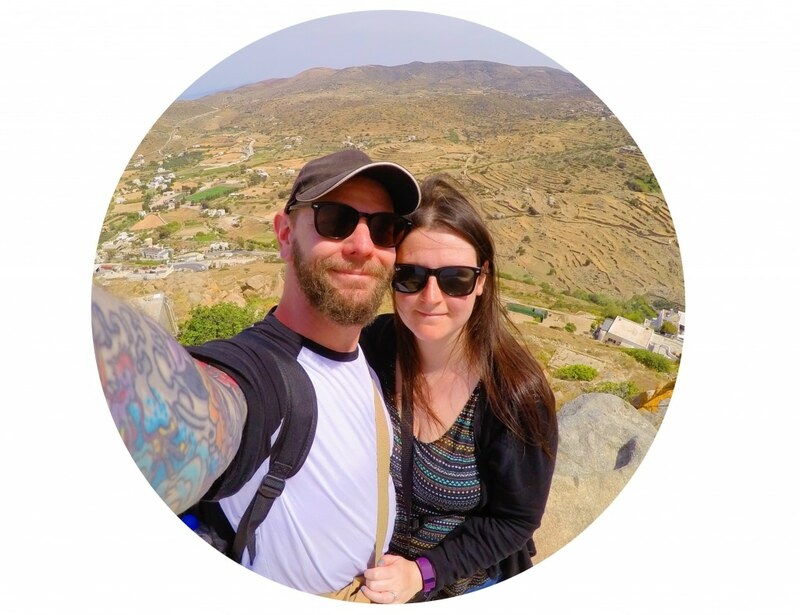 I can’t wait to hear about your trip! Mexican food is the best, isn’t it! I love mexican and Tex mex. This is the perfect kind of summer supper for me. yum! I am trying to spend as little time in the kitchen as possible at the moment with the heat. Mmmmm, this looks good! I love burritos, but they can get so messy. So this might be the perfect solution for me. Haha, I made such a mess when I eat them. Sorry to say that I’m just not a big fan of feta…especially with Mexican dishes. My mind really gets confused with feta and Mexican. It should be feta and Greek/Mediterranean. LOL! Anyway, what cheese do you recommend in place of the feta? Thanks! Love the HHH blog, facebook, etc!! I use feta, as it is a replacement for Cotija which is a Mexican cheese, but very similar to feta. The chicken sounds really good. I need to stock up on some herbs and spices I think! A good supply of herbs and spices is a must I think. It can really transform a dish. Avocado and feta are perfect together, especially on a Mexican dish. Looking forward to trying this.